This is very important message which I think i should share with all of you. It is my duty. This is the time a lot of traders will start buying calls or puts in the hope the stock markets will move rapidly on Feb 1 2017, and Feb 2 2017, due to the budget announcement on Feb 1, 2017 instead of end of Feb every year as a usual practice. Agreed the markets will move but there is no guarantee of who will make money. If it goes up, call buyers will make money. If it goes down, put buyers will make money. Some trader will trade the long strangle or the long straddle. INDIA VIX now is 16.49, that is 0.49 points up or 3.06% up from previous close. This will increase till the budget day. Once the budget is out it will start to drop at a rapid rate. Most option traders do not know that when VIX falls, the option premium also falls. Now here is the problem. Even if you got the direction right, there is a chance that the Option will not be increasing in the premiums in the way you thought it will. 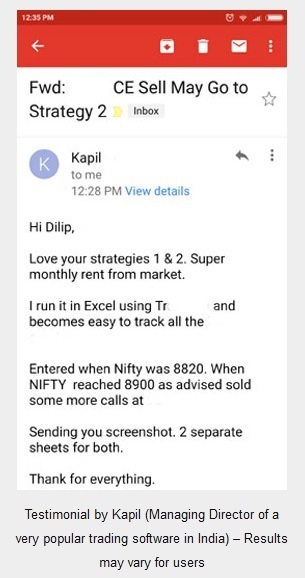 You will get disappointed and exit the trade in either a small loss, big loss or a very small profit. I have said it many times in my blog and I repeat it again. Take out the history of any businessman or a businesswoman. He or she must have taken years to make a lot of money. No one ever got rich in a single business or a single trade. Let us suppose you make 10k and exit. Will that change your life? No. So why take the unnecessary risk? That’s the reason I am telling you all please wait for the stock markets to stabilize, do not trade out of compulsion or fun. Please control your greed. This is the time to let fear take over and do not trade. Of course I will email what to trade on the budget day or before that to my course subscribers. Since it is a part of my course I cannot send that email to the free subscribers. This is in continuation of my yesterdays email. I said the VIX will increase until the budget day. Today INDIA VIX has increased by 1.44% and is currently at 16.91 at 1.19 pm. If any tax is levied on long term capital gains in equity markets or mutual funds, investors will take it negatively – Nifty and BSE both will nose dive. Long term capital gains is profits made on selling a stock or equity mutual fund after holding it for one year. Corporate tax is also important. If it increases stock markets will fall. Traders psychology is strange. If both the long term capital gains and corporate tax does not change, investors will take it positively and stock markets will move up. Remember that long-term capital gains tax is not yet factored in the markets. So definitely if done, it will be taken very negatively. Another important factor is the income tax. There is some kind of news going on, that the Finance minister may reduce the direct taxes. I really do not think both of the above will happen. The government knows very well that a lot of people recently suffered from the 500 and 100 note ban. If they impose taxes on long-term capital gains then their image may get affected, and they may lose power in next elections. The timing is not right to impose long-term capital gain tax now. Corporate taxes, frankly no idea. They may or may not increase. But this is the problem of big corporations. This will not affect retail investors in stock markets. However the biggest issue which takes everyone into it is – direct income tax. This will definitely be the biggest game changer – for the stock markets as well as the country as a whole, if anything is changed. If it is decreased even by 2% investors will jump in joy and stock markets will get a fillip. In that case 9000 for Nifty will not be very far. But it all depends on what happens on the budget day tomorrow on 1st Feb, 2017. So keep your fingers crossed, and wait till you get an idea of trade. Of course I will tell what to trade to my paid subscribers. Please note that I am not a tip provider either through SMS/WhatsApp/email. 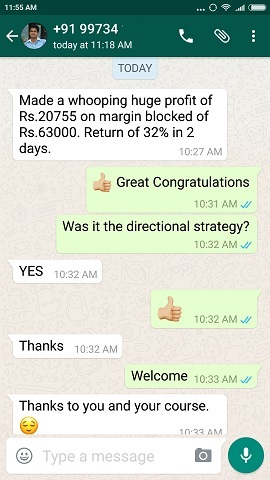 I give proper ideas and education of stock markets to my paid as well as free subscribers. 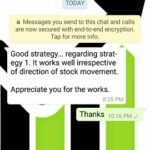 My course subscribers have an edge because they have knowledge of non-directional trading and option hedging that’s the reason they are not afraid to trade. 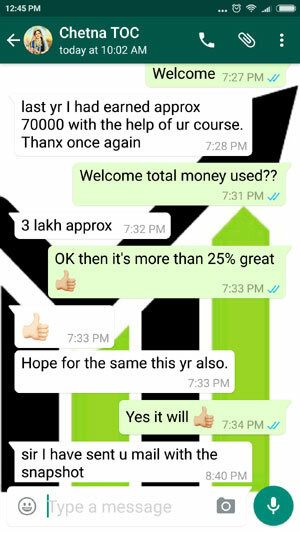 In the long term it is only education that helps, tips can destroy your capital. So please take an informed decision. I want to help you. 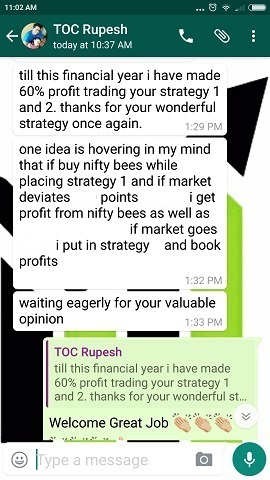 thanks for value worthy advice. Thanx for sharing such a valuable information. sir i would like to ask you what is fees for paid course so i can join. Details of course fees is here.